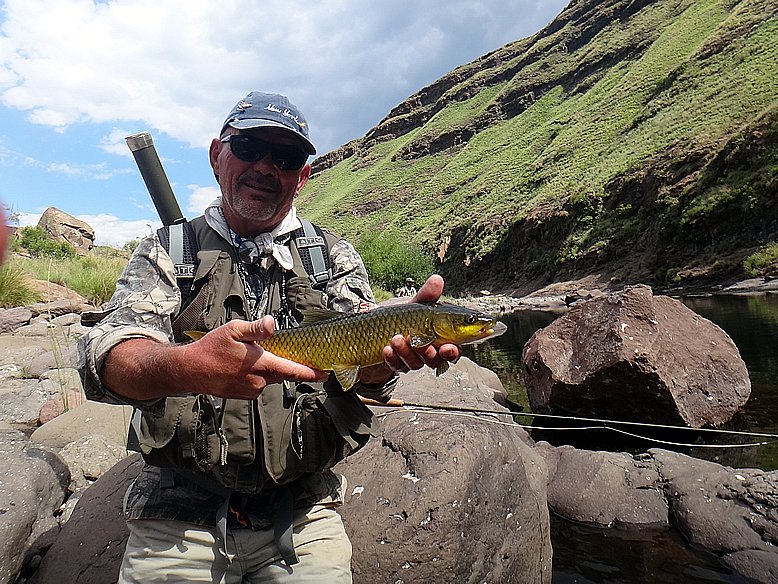 We have just returned from a tough, low water trip to the Bokong River in Lesotho, targeting Yellowfish which we had hoped would be in the runs in a faster flowing stream. 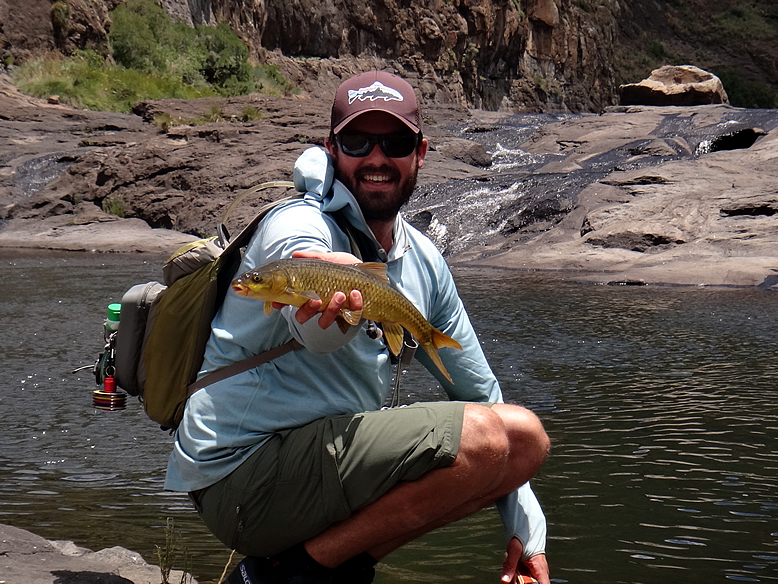 That wasn’t the case, the rains hadn’t come, and the flows were minimal , the water gin clear and the fishing tough. Of course that leads to experimentation and the sort of anally retentive fiddling that can only arise within a group of dedicated anglers and fly-tyers faced with tough low water conditions. All those flies so lovingly prepared ahead of time, trying to cover all the possible bases were mostly ineffective. The preparations had expected high water, or good flows, but not really the slack water with which we found ourselves confronted. Preparation is frequently the key to success, but sometimes you get it wrong. Dozens of ant patterns remained nearly untouched. It became apparent that the fish were fussy and being “locked” in the pools for the most part, were easily hammered by group after group of anglers and they weren’t going to easily escape the situation until the thunder showers returned and put some water in the river. Some of the fish could be taken on dry flies, (our preference really) when the going was good, but for the most part subsurface patterns provided more fish. The trouble was that the traditional nymphs which we would have expected to work well were less than totally effective and in the end small patterns with split thread CDC collars proved to be the hands down winners. On one occasion, having caught a fish or at least elicited a take every cast (including three hook ups in three casts) I eventually used up the couple of CDC collared nymphs I had,(break offs due to a sticky reel drag not helping the situation) Once limited to non CDC nymphs, the sort of faster sinking, slim profile flies that would be the mainstay of Yellowfish fishing on moving water, I didn’t get any more takes on the nymph. Variations of this fly worked for all of the anglers . 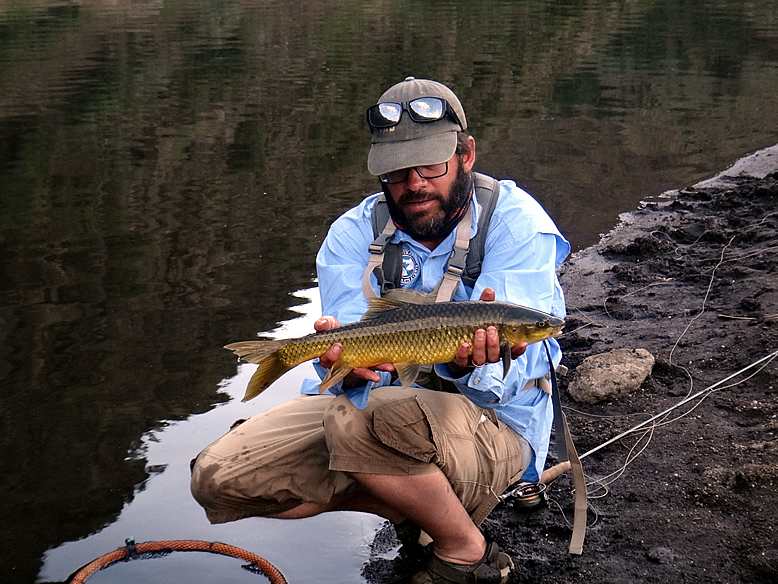 It was obvious that there was something about these patterns which the fish wanted, or at least something that triggered a response that the less mobile flies didn’t. The working hypothesis was that with such little flow there wasn’t much to cause the nymphs to “look alive”, but the mobility of the CDC provided, even in dead water, enough movement to suggest life and elicit a strike. 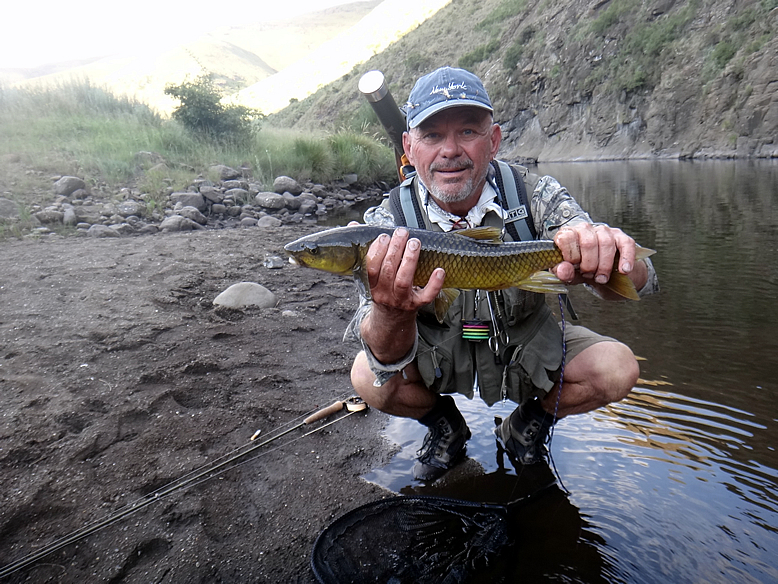 A remarkably calm Gordon van der Spuy, admires a dry fly caught yellow. 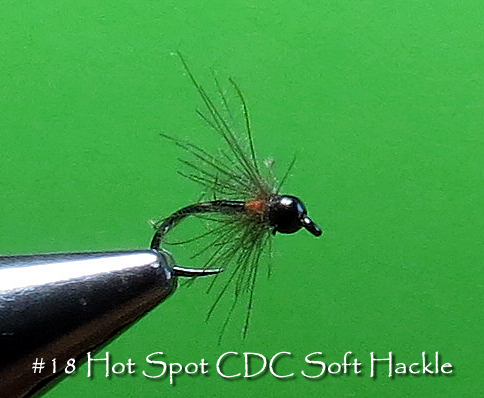 I have used CDC collars on a lot of soft hackle patterns on trout streams to great effect, and have always considered that their very “helplessness” might be a trigger to the fish. (see: https://paracaddis.wordpress.com/2016/03/07/vulnerability-a-super-stimulus/) .But here I think that there was more going on. What we had in effect were “Ultra-soft” soft hackles and they worked like a charm. 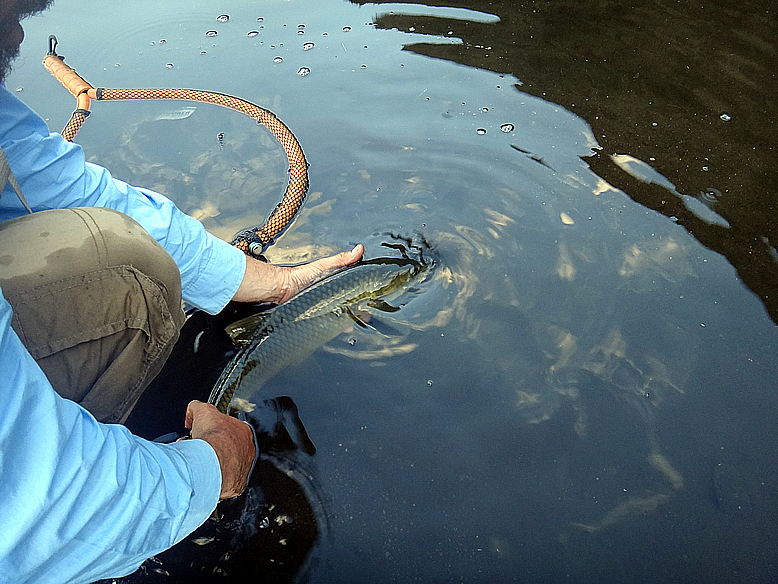 It has long been recognized that movement and even micro-movement in flies can provide a real trigger to the fish. Brushing out the dubbing on your hare’s ear nymph, adding a marabou tail and such seem to improve effectiveness and it would seem that when there is so little water movement, the more mobile the fibres the better. So then it was that we all, virtually to a man, ended up fishing a dry and dropper rig with the dropper a lightly weighted and simple CDC collared fly that did the business. All the fish were carefully released. Well worth consideration next time you are on the water, particularly where there is little movement, perhaps a lake or a slack stream pool, that addition of micro-movement may well save the day. 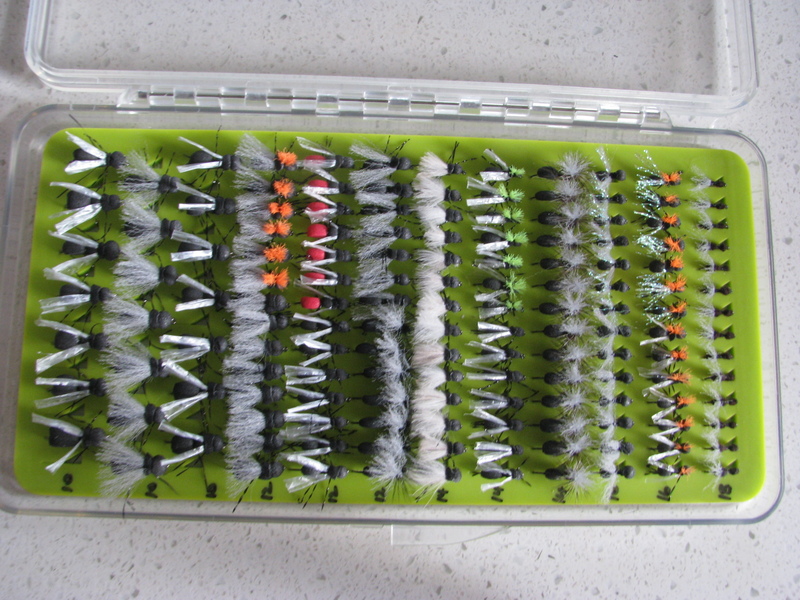 Certainly I am going to consider this in some of my stillwater flies, it seems likely that micro-movement in flies fished static in still water may be a very good way to go. Fishing trips are often a gamble, but the ability to work things out, to experiment and learn something are often the defining memories of tough conditions. CDC is frequently seen as a dry fly game changer, but inclusion in some of your sinking patterns is well worth consideration.. particularly for those fishing low flows or stillwaters. 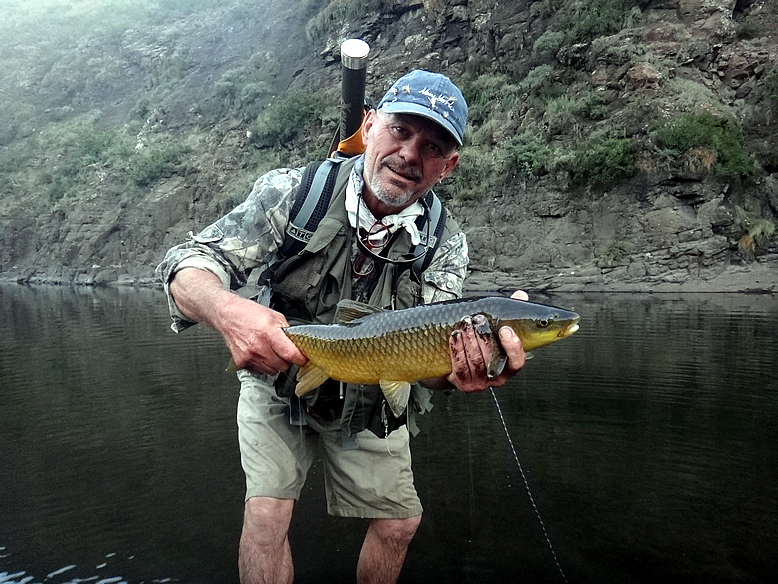 Author’s note: The Bokong fishery at the Makangoa Community Camp is run by Tourette Fly fishing the camp provides exceptional comfort, both yellowfish and trout angling at different times of the year, quality guides and the sort of vibe that makes for a great fishing trip. The location is remote and at high altitude, hiking abilities are pretty much essential , the road ends just above the camp. But if you are up for some spectacular angling and beautiful scenery, combined with some big fish and clear water check it out.